As I mentioned in a previous post, Introduction to the Concept of Antioxidant - A Demo, chitosan is able to counteract oxidation and it also features antimicrobial properties. Besides that, chitosan can also be used in wastewater treatment related fields since it is considered to be one of the best biopolymers able to remove pollutants from wastewater1. One of the most striking aspects of this material, is its low-cost; it is actually produced by deacetylation of chitin which is extracted either from crab shells or from the exoskeleton of sea creatures such as crayfish, lobster, prawns and shrimps2. In addition, chitosan is non-toxic and biodegradable. The structural formulas for chitin and chitosan are shown in figure 1. 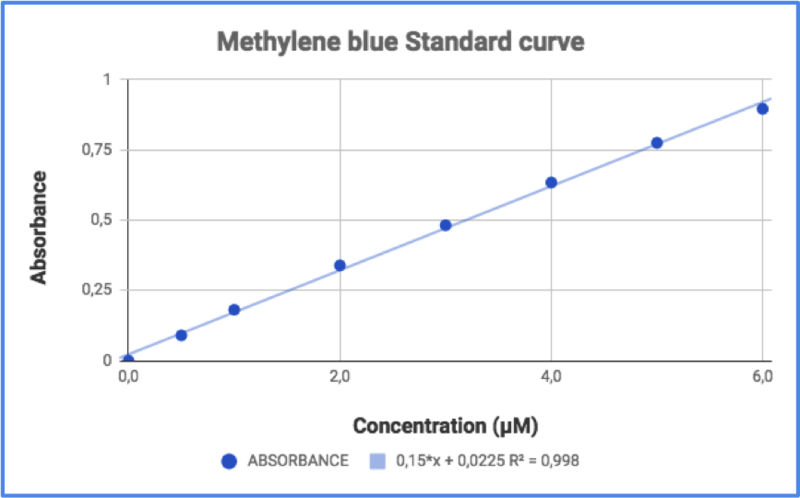 Many experiments have been carried out by testing the adsorption properties of the materials toward methylene blue (MB) which is the most commonly used substance for dying cotton, wood and silk. It can cause eye burns though and the treatment of effluents containing MB is of interest due to its harmful impacts. 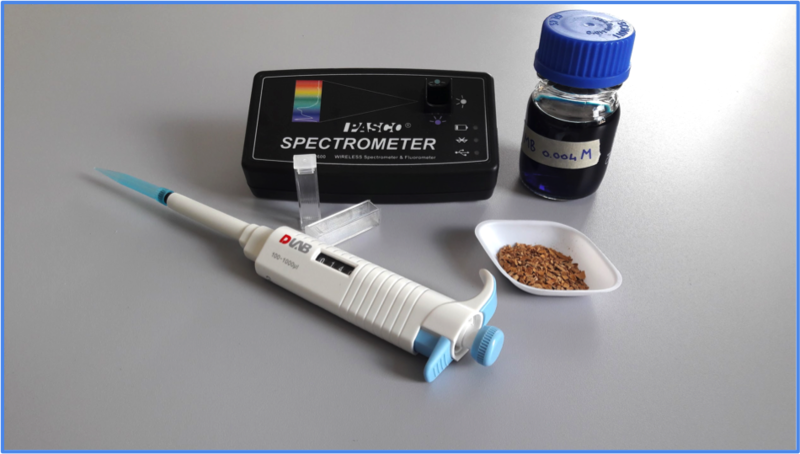 An interesting adsorption agent which can be used for wastewater treatment purposes is sawdust which is a by-product of the wood industry than can be used either as a fuel for cooking or as a packing material. Its cost is virtually negligible and its has proven to be a promising low-cost material for the removal of MB from wastewater. With the same purpose, plenty of food wastes such as fruit seeds (orange, apple, mango etc), fruit peel, leaves, can be used as well. 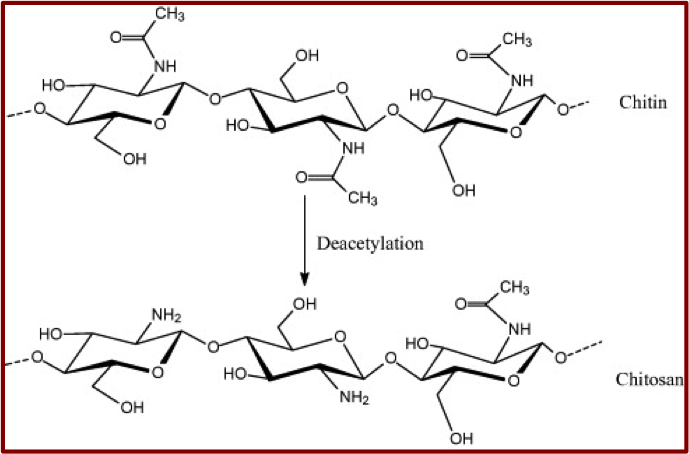 Through my reading of the topic, it came out that almond shells are also able to reduce the concentration of some dyes in aqueous mediums; it seems that lignocellulosic material, due to the presence of organic compounds such as lignin, cellulose and hemicellulose, are able to bind dyes such as MB through different mechanisms3. Luckily, growing up in a family from the south of Italy, almonds are always present in my house so it wasn’t difficult at all to get a lot of their shells. 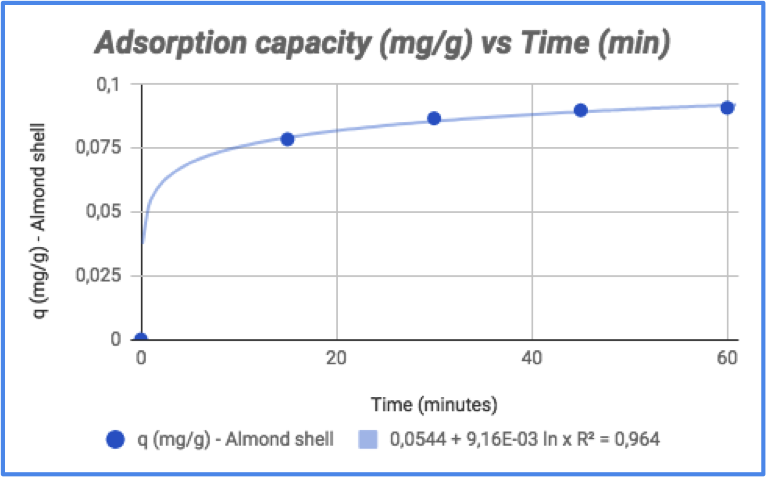 I have been lucky again since in the lab where I work, plenty of MB can be found (both powder and solution) so I decided to test the adsorption properties of almond shell towards MB whose structural formula is shown in figure 2. Figure 2 - Structual formula methylene blue. The first step was the building of MB calibration curve. To do that, I used a MB commercial solution whose concentration was 0.004 M. I made dilutions in order to get a concentration interval from 6 µM to 0.5 µM; if the concentration is too high, calibration curve tends to lose linearity. Chosen wavelength was 654.6 nm. The calibration curve and its equation are shown in figure 4. I carried out a bunch of trials and results turned out to have the same trend which is a logarithmic one. Of course, single results were a little bit different from each other because of likely different experimental conditions but in the end the final trend was always the same. Now, we move on to the actual experiment. Prepare a solution of MB in a volumetric flask by adding 140 µL of MB solution (as said before, I used a 0.004 M commercial solution) in 20 ml of distilled water; give it a nice mix and bring the volume up to 100 ml. Record the absorbance of that solution and calculate its concentration by using the calibration curve. That will be the concentration at time zero (t=0). Pour 25 ml of that MB solution into a 100 ml Erlenmeyer flask and add 0.5 g of the previously ground almond shells. Start the stopwatch and collect absorbance data every 15 minutes. For each measurement, I took a 2 ml sample and analysed that by the spectrometer. I would recommend you not to swirl the flask but to use a glass stirring rod to mix the content of that; in fact, since the shells get wet after the contact with the solution, they tend to stick to the walls of the flask while swirling that. Depending on the size of the shells, you can filter the solution before data collection; to do that, I used 3.0 µm syringe filters which I found very useful since they allowed me to get a clear liquid. Though, if the shells are quite large, that operation might be skipped since it is unlikely you get those shells by using a pipette. In one trial, where the shells were quite large, I skipped the filtration process and I had no significant effect on the quality of the spectra. Therefore, if this experiment is set as a demo, you can avoid filtration. In each case, as said before, at the end of the data collection I got the same trend; here are the results for one of the trials I carried out. 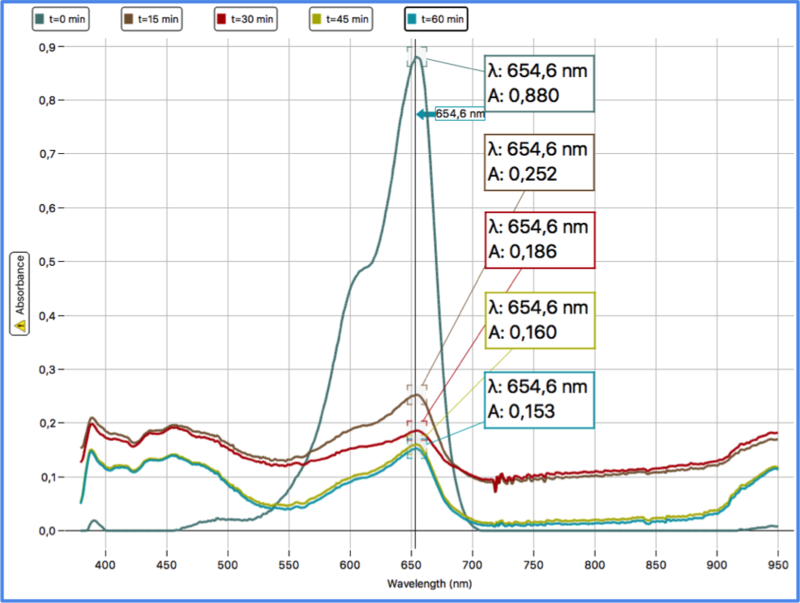 The spectra and processed data are reported in Figure 5 and in Table 1. Where C0 is the concentration at time zero and C is the concentration after the starting point (both in mg/L), m is the mass of the adsorption agent (g) and V is the volume (L) of the solution used to carry out the experiment. It indicates the amount of dye (mg) adsorbed per gram of (in this case) shell. Both the concentration and adsorption capacity over time are reported in figure 6 and 7 respectively. 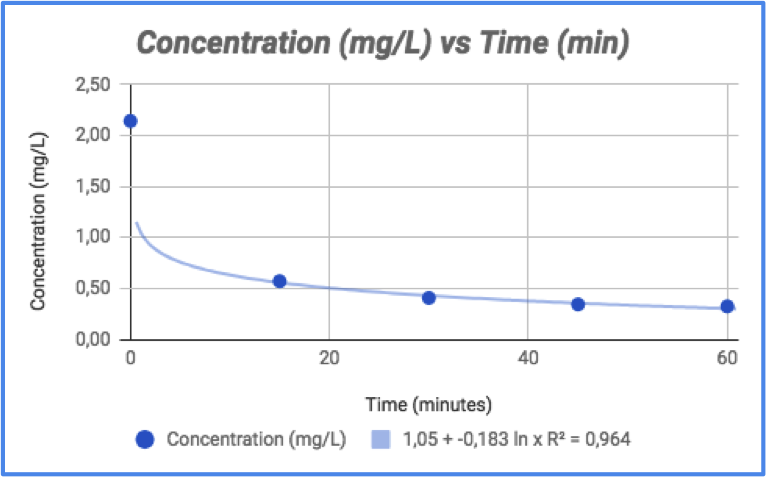 By looking at the graphs, it is clear that most of the dye is removed in 15 minutes; after that time, concentration reaches a plateau and its variation is significantly lower. In terms of color change, that can be seen by looking at figure 8. 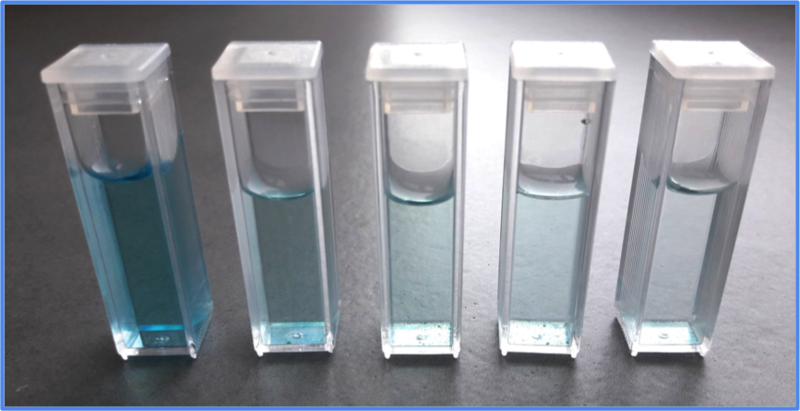 Figure 8 - from left to right - example of solution at 0, 15, 30, 45 and 60 minutes exposure to almond shells. As you can see in figure 8, the liquid at t = 0 is more intense in color; after 15 minutes that intensity fades away and it is basically the same from 45 minutes to 60 minutes. Of course, this experiment does need to be implemented quite a lot. I did not consider the size of the adsorption agent particles and other experimental conditions (pH, temperature, additional contact time, amount of shells etc) but I do believe that the final result is quite interesting because of the simplicity of the principles behind. In fact, by using a poor material, it is possible to improve the quality of an aqueous medium. I hope you find this quick test interesting and useful for introducing some environmental chemistry ideas in your lessons. As usual, I am open to suggestions and advices! 1 - Carbohydrate Polymers 113 (2014) 115–130. 2 - International Journal of Research in Pharmaceutical and Biomedical Sciences, 4(1), 312–332. 3 - Journal of Hazardous Materials, 177 (2010) 70–80.